In around a month’s time I’ll be leading a creative writing workshop at Carol Peace’s sculpture studio on writing from art, and I thought I’d give you a sneak preview. 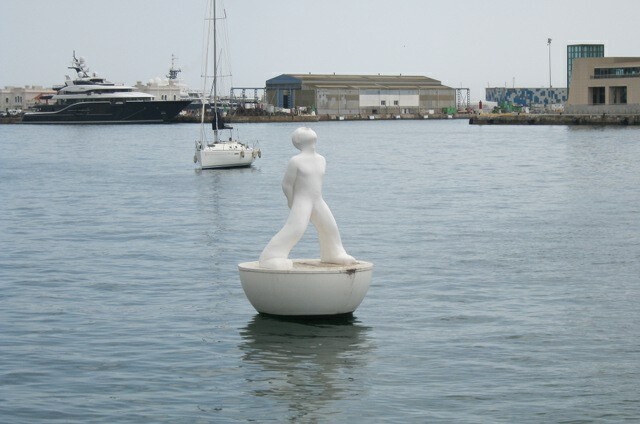 The pictured sculpture is actually Stargazer by Robert Llimós, snapped in Barcelona when I visited in June. I chose it for this post because I know Carol retreats to the Catalan city at every opportunity to draw inspiration for her own art. I also particularly love the contemplative quality of this piece – it makes me think of beautiful fantastical children’s books involving journeys across oceans and into the stars. Consider what might be going through the mind of the boy, what his fears and hopes might be. Throw in a detail from a child you know or knew (yourself as a child, perhaps) – a passion such as playing football or eating popcorn – then turn your impressions into a prose poem. Discard any bits that seem trite or clichéd, and explore further the sections that ring particularly true. You might be surprised by what takes hold. If you write something prompted by this, please let me know by sending an email to Judy(at)socket creative.com. With your permission, I’d love to share it on SkyLightRain.com. This entry was posted in Writing prompts and tagged inspiration for writers, story ideas, writing from art, writing inspiration by Judy. Bookmark the permalink.